If someone were to ask me what episode I would show to someone who’s never seen Buffy before, I would show them two episodes: “Prophecy Girl” and “School Hard.” Prophecy Girl is the Season 1 finale and it introduces the world that Buffy takes place in and all the characters really well. However, the reason I choose “School Hard” for this blog post is because this episode establishes the theme of the season, establishes the main cast, and introduces two characters who will be a staple of the show for years to come. The episode starts out with Buffy in the Principal’s office with a delinquent named Sheila. Principal Snyder wants the two of them to work together to decorate and make refreshments for Parent-Teacher Night. Buffy meets up with Xander and Willow and Xander tells Buffy to not worry so much. “As long as nothing really bad comes along between now and then, you’ll be fine,” he says. Buffy and Willow are quick to point out that now something bad is gonna happen in an almost self-aware sense. Xander thinks this time may be different. He’s totally wrong, of course, because in the next scene we see a black car running over the “Welcome to Sunnydale” sign and an intimidating, black leather duster wearing, punk-rock vampire steps out, lighting up a cigarette. Ladies and gentlemen, meet the vampire that stole my heart. In the previous season, there was a minor villain called the Anointed One who is scene in his lair with his cronies. They all plot on killing the Slayer on something called “the Night of Saint Vigeous” and one of them says it’ll be the greatest thing since the crucifixion, bragging that he was there. Spike, of course, is not amused. Neither am I, for obvious reasons. When Spike walks in the room with the other baddies, the attention is all on him. Mostly because all the other vampires in the room are about as interesting as the back of a cereal box. Spike starts bragging (he likes to brag) about the Slayers he’s killed when a haunting music box type melody takes over the room. 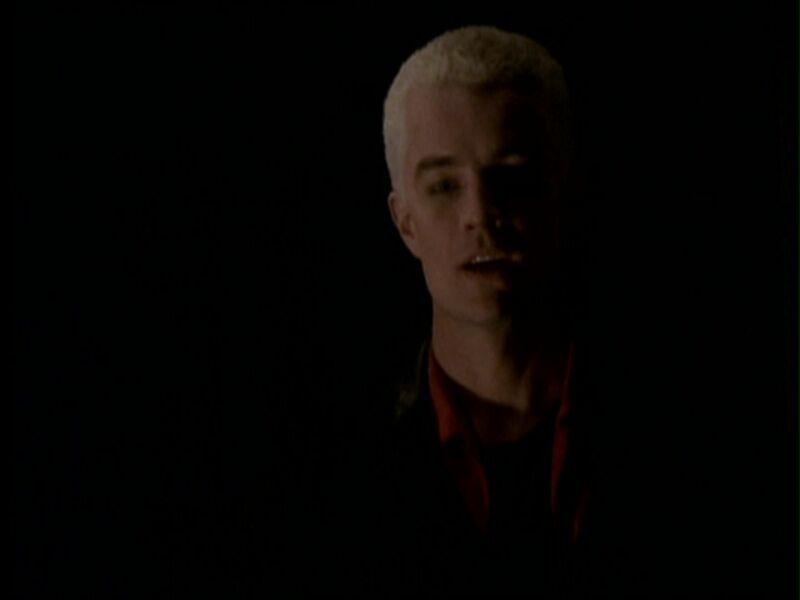 Spike turns around and we get to see his human visage for the first time as his lover, Drusilla, walks in the room. Like Spike, Drusilla is a vampire that you can’t help but be drawn to. She reminds me of those creepy ladies in horror movies that talk nonsense and walk like ballerinas. There’s a certain fragility to Drusilla and the love and affection the two of them have for each other feels genuine even when you take into account that vampires supposedly “can’t love.” When Drusilla asks Spike to kill the Slayer, Spike tells her “I’ll chop her into messes.” Shakespeare buffs might recognize this line from the play Othello in which the titular character says this line in reference to the woman he loves. However, Spike is saying this line in reference to Buffy. In the next scene, Buffy has a short conversation with her mother regarding Parent-Teacher Night in which Joyce wants to believe in the best for Buffy but worries about her being irresponsible, since she’s totally unaware of Buffy’s life as an unofficial superhero. Our favorite Slayer laments about the responsibilities she has to deal with as she paints the banner for Parent-Teacher night. My internet friend Ian AKA Passion of the Nerd points out that there’s an interesting parallel between Spike and Buffy, when Dru cuts Spike’s cheek and Buffy shows up in the next scene with a line of paint on her cheek in that same area. Trust me when I say this will be the first of many parallels between Buffy and Spike. But to go any further would make this a mile-long Spuffy post. Moving on! Giles and another teacher, Jenny Calendar, come in to warn Buffy about the Night of St. Vigeous which is supposedly a night when vampires (after three days of fasting and rituals) are at their strongest. I’m honestly not gonna go into much detail beyond that because the show never actually showed the Night of St. Vigeous happening. It’s honestly just a MacGuffin that goes nowhere. Later that night, Buffy tries studying at The Bronze to no avail because she’s pining for Angel. She goes off to the dance floor with Willow and Xander and a very telling song plays as Spike watches Buffy dance. Spike does a stage whisper about calling the police about someone getting bitten outside, which prompts Buffy and company to make for the alley. Buffy beats up the vamp and stakes him easily (with a bit of Xander’s help) and Spike walks in, applauding her. Spike goes off to another nightclub to catch Shiela while the Scoobies convene in the Sunnydale High School Library to research on Spike. Angel comes in to warn everyone about Spike, but leaves before giving any actual useful information. Meanwhile, Spike returns to Drusilla with Sheila in tow and a bit of backstory gets revealed. Dru was attacked by a mob in Prague which left her in a weakened state, prompting Spike to take her to the Hellmouth and help her recover. 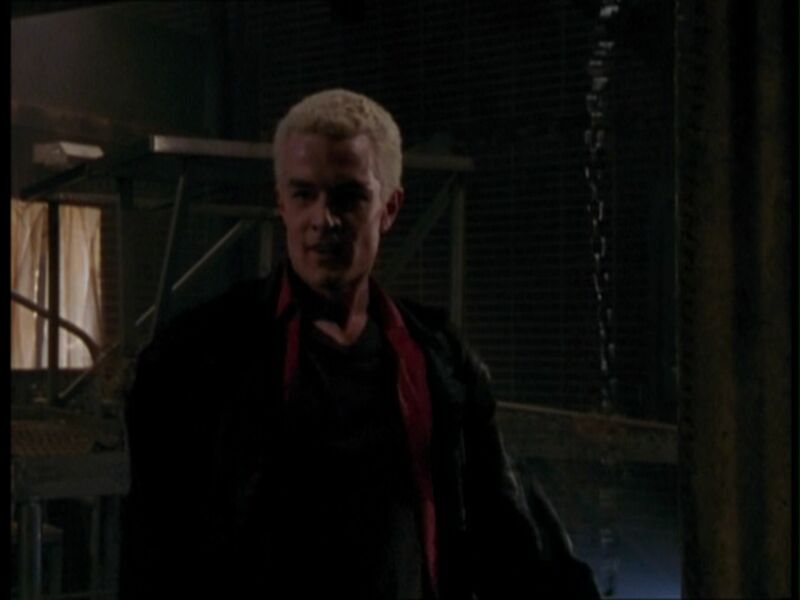 Spike goes off to perform the rituals with the Anointed One and tells Drusilla to feed, shoving Sheila at her. The next day, the Scoobies prepare for battling the vamps while Buffy preps for Parent-Teacher Night. Cordelia, Buffy’s high school rival, shows up in the scene as sort of a “frenemy.” Joyce inevitably meets with Principal Snyder and it’s clear that Buffy will be on a one-way trip to Grounded-ville. 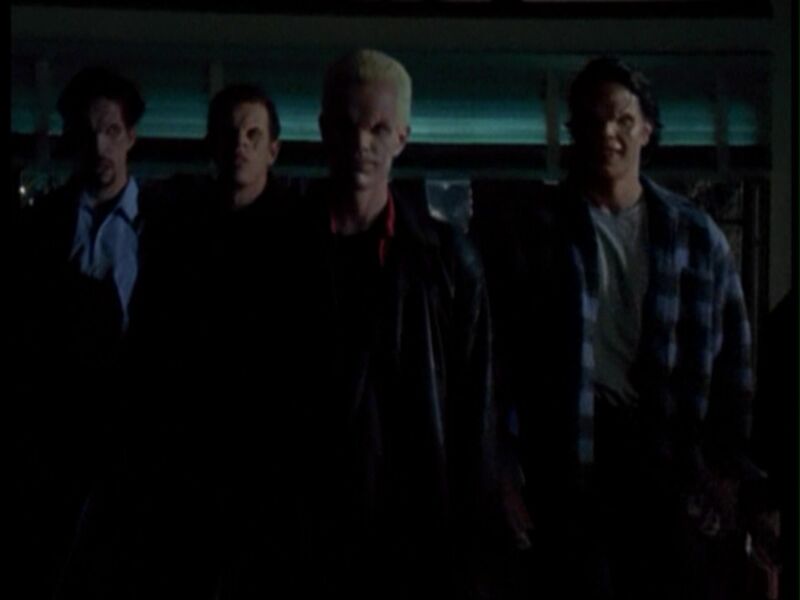 Of course, just as things are about to go south for Buffy, Spike and his cronies break into the school. Why? He was bored and has major impatience issues. Now the reason the episode is called “School Hard” is that the ensuing moments are reminiscent of the movie Die Hard, in which a bunch of people get trapped in a building while the hero saves them from terrorists by sneaking on the enemy through air vents. Buffy takes initiative and hides the adults and teachers in a classroom. Giles and computer teacher Jenny Calendar hide off in the library, Xander goes off to get Angel’s help, and Willow and Cordelia hide in the janitor’s closet, which they still end up staying in by the end of the episode. When Angel gets Xander’s help, Angel tries to use Xander as bait. 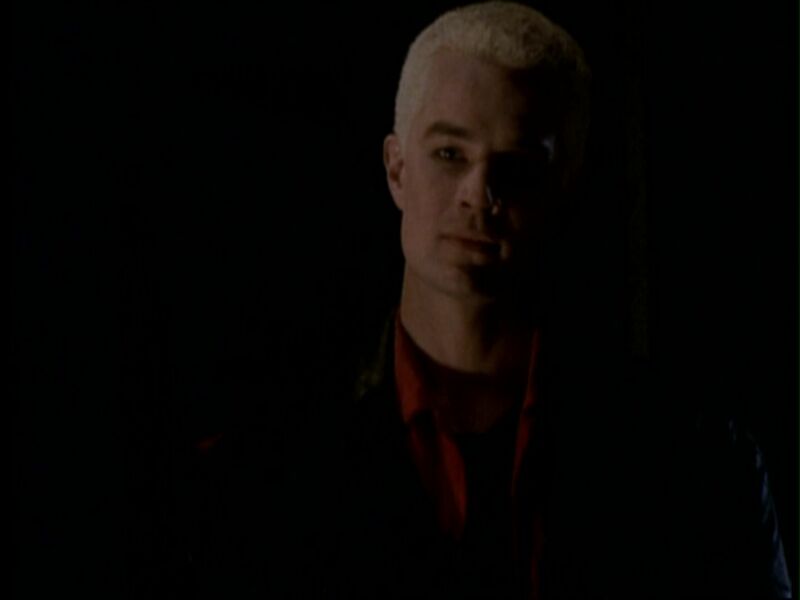 Spike recognizes Angel as his “sire” and calls Angel “Angelus,” which was his old vampire name. In the Buffyverse, a sire is the vampire who creates another vampire, their Childe. 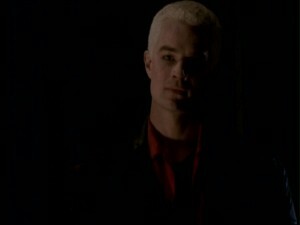 It’s later established that Drusilla was the one who created Spike but that Angel was Spike’s mentor in all things evil. Spike takes down a vamp and fights off a newly vamped Sheila while getting her mother and all the other adults out. 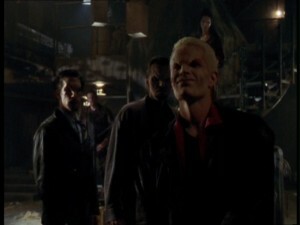 Spike’s minions give chase to Angel and Xander, but Spike stays behind when he smells Buffy’s blood. But enough swooning. Time for a fight scene! Spike and Buffy spar out in the hallway while Angel and Xander fight Spike’s minions outside. 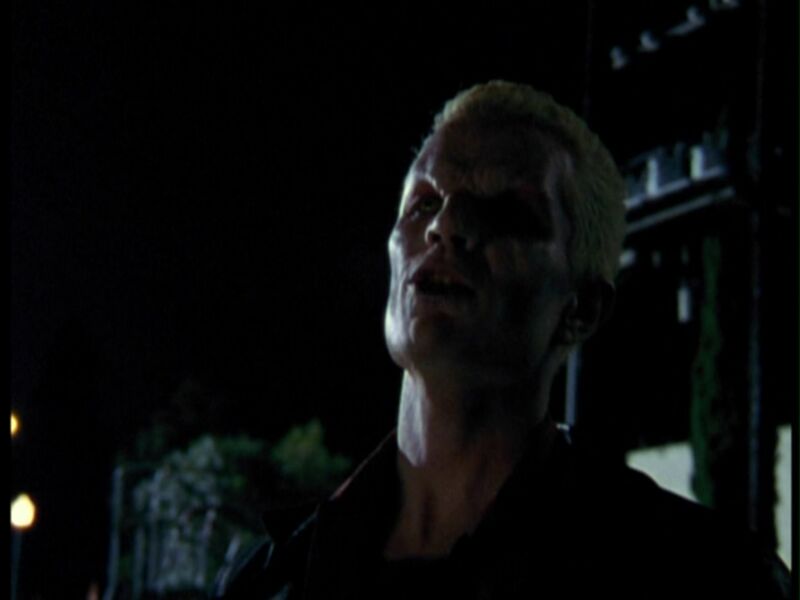 But just as Spike was about to get the upper hand on Buffy, Joyce hits him on the back of the head with an axe and says “You get the hell away from my daughter,” prompting Spike decides to make a run for it. Snyder and the police talk about what the “cover story” of the attack on the school will be while Joyce and Buffy have a heartwarming moment in which Joyce realizes that Buffy is capable of taking responsibility when the moment calls for it. The episode ends with Spike pretending to ask the Anointed One for mercy, but we all know that Spike isn’t one for apologizing when he doesn’t actually feel sorry. He throws the Anointed One into a cage and lifts the child vampire into the sunlight, establishing that he’s the new Big Bad in town. I seriously love his bravado! If you’re not familiar or a fan of Buffy the Vampire Slayer, I highly recommend you watch this episode. If there was one thing about this episode that I wish could’ve gone differently, it would’ve been that Joyce would’ve found out about the vampires and decided to accept Buffy’s life as the Slayer. But overall, I love what this episode had. For old school fans, it’s a major nostalgia trip because you get to see the characters in the earlier days and think of how things could’ve played out differently and for newcomers, it’s a good way of learning who everyone is and what exactly Buffy is about. So yeah, go watch it!